The entrance to County Hall is on Belvedere Road – please note this IS NOT on the river side of the building, Belvedere Road runs parallel to the river to the rear of the building. The door to the venue is situated in the middle of the building, half way down Belvedere Road opposite Forum Magnum Square. The nearest stations to the venue are Waterloo and Westminster – both a pleasant 5 minute walk away. You’ll find answers to most questions we often get asked below. If for any reason you cannot find what you’re looking for please drop an email to the events team atinfo@waitrosedrinksfestival.com and we will aim to come back to you within two working days. Alternatively, please call the customer services team on 0800 188 881 and they will forward your question to the events team. Tickets are£35. This gives you access to the drinks festival and allows you explore areas on offer. Suppliers will offer samples throughout the show and there will be the option to buy some of the selected products on site as well as making a note of items to buy at a later date on waitrosecellar.com. Sessions last for four hours and refunds are not possible if you are not able to attend on the day. Additional items such as masterclasses, workshops and seminars are available for an additional price and can be found on the website. One on Sunday 18th November from 12pm-4pm. The full address of the venue is ETC County Hall Riverside Building, Belvedere Road, London SE1 7PB. The venue is situated on the Southbank of the Thames, etc.venues County Hall has an enviable location next to The London Eye with breathtaking views over The Houses of Parliament & Big Ben and easily accessible from both Waterloo and Westminster stations. There is no parking available at the venue. The closest parking is at Waterloo Car Park, 39 York Road, London, SE1 7NQ. Can I see a floorplan of the event? The Drinks Festival is laid out across two floors of the venue (third and fourth). 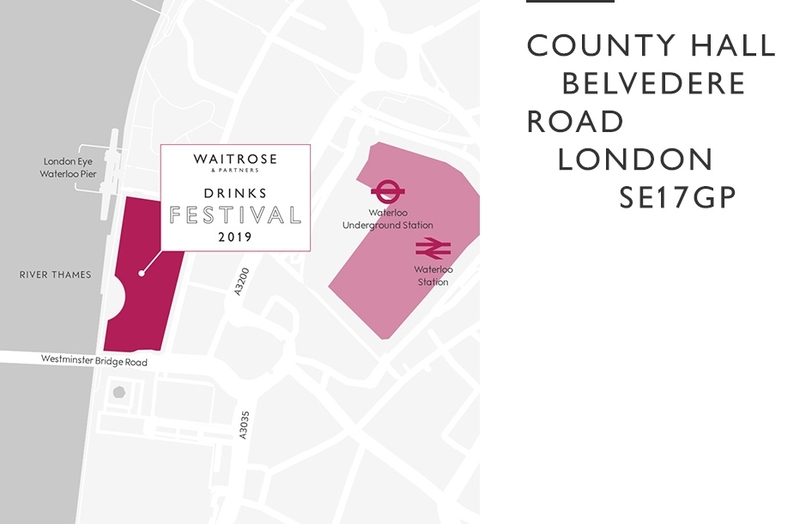 We will send you a floorplan a week before the festival in an email from the Waitrose Drinks Festival. If I arrive early, will I be able to get in? We will be aiming to open the doors to registration approximately 20 minutes ahead of the session start times. However, this will only permit entry to the registration area and coffee lounge – the event will not open to supplier stands etc until the listed start time. Please be aware that the event takes place on the third and fourth floors of the building, with lift access or use of the stairs being the best way to access the registration area. Will I get a new glass for every wine I taste? We are running a traditional wine tasting and therefore the glass you collect at the beginning of your experience, should then be reused (swilled out with the water and spittoons provided) for your whole time in that area. Designated ‘pick up’ and ‘drop off’ points will show you where you should swap your glass over. Both water and food will be included in the price of your ticket. There will be water free of charge at various points at the Drinks Festival. We have a host of speciality food suppliers situated in the Beer, Cider and Food Room on the fourth floor, where you can sample a variety of products. Other Waitrose food will be showcased and roaming around the event, so make sure you pick up something delicious when it passes you! We will be operating a ‘Challenge 25’ policy at the event, and as such will be asking any visitor who is lucky enough to look younger than this to provide photo ID on the door in order to gain access to the event. Failure to provide photo ID will result in entry being denied and in this instance we will be unable to provide a refund. As above, we may ask to see photo ID for you to gain access to the event. It is also useful to bring a note of any suppliers who you would particularly like to visit, along with your confirmation email showing which additional experiences you have booked via our website. Please do refrain from bringing any large bags/luggage as cloakroom space at the venue is reasonably limited. Can I register a friend/another guest? Yes simply purchase the number of tickets you require. You will be asked to enter your details as the lead guest and then the name and date of birth for each of your guests. Your guest/s will be asked for their email details on the reception check in desk in order that we can email their drinks preferences after the event. I bought the wrong ticket, can I get a refund? Yes if you no longer require your ticket you can request a refund by contacting the events team at info@waitrosedrinksfestival.com and we will aim to come back to you within two working days. Alternatively, please call the customer services team on 0800 188 881 and they will forward your request to the events team. We regret that we are unable to process refunds within two weeks prior to the event. I have already bought tickets, can I add extras? Yes. Please contact the event team at info@waitrosedrinksfestival.com and we will aim to come back to you within two working days. Alternatively, please call the customer services team on 0800 188 881 and they will forward your request to the events team. We regret that we are unable to add extras 48 hours prior to the event however these can be purchased on the day if we have availability. Once you have purchased your tickets you will receive an email confirmation with an order number. Please bring your order number with you to gain access to the event. Why can I not buy tickets for certain extras? The extras have limited availability so if they do not appear on your screen when purchasing tickets it means they have sold out. Please do take a look at some of our other masterclasses or workshops. Will I be able to purchase additional experiences when I arrive? If we have any availability left for our additional experiences, these will be listed at the information desk on the third floor, so please visit the team there in order to purchase tickets. I’ve lost my confirmation email, what do I do? Providing you have purchased tickets you will simply need to give your name and email on arrival. If you are unsure if you have purchased tickets please contact the events team at info@waitrosedrinksfestival.com and we will aim to come back to you within two working days. Alternatively, please call the customer services team on 0800 188 881 and they will forward your request to the events team. Are there toilets at the venue? Yes, throughout the venue there are several sets of toilets, including accessible toilets. Once you have registered on entry, you will be able to enter the main spaces and use the facilities. Yes there will be and this is free of charge for coats and bags. The venue, Waitrose and the events team do not accept claims for any lost coats or bags left in the cloakroom therefore we recommend you do not bring items of significant value to the event. Any guests that lose their tickets may be required to wait until the end of the session to claim their items. All lost property left in the cloakrooms will be donated to charity one month after the event if not claimed. I have left an item in the cloakroom or at the venue, what do I do? Please contact us with a full description of the item on email toinfo@waitrosedrinksfestival.com and we will aim to come back to you within two working days. Alternatively, please call the customer services team on 0800 188 881 and they will forward your note to the events team. Should your item be found we will hold this in a central London office for collection within one month. We can arrange for items to be posted for a small charge. Any items not claimed within one month will be donated to charity. Yes both event floors are fully wheelchair accessible. Please contact the events team at info@waitrosedrinksfestival.com and we will aim to come back to you within two working days. Alternatively, please call the customer services team on 0800 188 881 and they will forward your request to the events team. Please read and understand the following terms and conditions as they are binding for all ticket purchases. By clicking on "I agree to the Waitrose Drinks Festival terms and conditions"
that they shall be bound by these terms and conditions accordingly. Please direct any questions, or any subsequent issues, to: customerservices@waitrose.co.uk or send to Waitrose Limited, Doncastle Road, Southern Industrial Area, Bracknell, RG12 8YA. In these terms and conditions, “Waitrose” “we”, “us” and “our” refer to Waitrose Limited, a company registered in England and Wales with company number 99405, VAT number 232457280 and registered address 171 Victoria Street, London, SW1E 5NN. Guests are responsible for ensuring that all details submitted are accurate and correct. Payment must be made in full at the time of booking. All amounts quoted are inclusive of VAT. The booking and payment process for the classes is facilitated by (i) Story Events Limited a company registered in England and Wales with company number 08344007 with registered office at 103 Charing Cross Road, London, WC2H 0DT; and (ii) Kick Digital Limited a company registered in England and Wales with company number 08967728 with registered office at Unit 2 Endeavour House Parkway Court, Longbridge Road, Marsh Mills, Plymouth, Devon, PL6 8LR. Your personal information will be processed by Story Events Limited, Kick Digital Limited and any subsequent data processor supplying booking and payment services in accordance with our instructions and in compliance with any applicable data protection legislation. Refunds will be possible up to two weeks prior to the event opening. Please contact info@waitrosedrinksfestival.co.uk if you would like to discuss this with the team. Please note that no refunds will be offered in the event that a guest is unable to attend within two weeks of the event or on the day. Exchange or transfer of tickets will only be possible under certain circumstances and will be subject to availability. All requests for exchange or transfer should be submitted to info@waitrosedrinksfestival.co.uk a minimum of 14 days ahead of the event opening. We reserve the right to cancel the event, with reasonable notice and will notify the ticket purchaser in writing, should this happen. Guests will be given a full refund of ticket prices should the event be cancelled by Waitrose, however no associated costs (such as travel, accommodation etc.) will be paid. We reserve the right to change the date of any event for any reason. If we do so, we will endeavour to give Participants reasonable notice, and, where Participants cannot attend the event on the new date, Participants will receive a full refund of the amount paid for that event. We will not be responsible for travelling or associated expenses. We will endeavour to run the event as advertised. However, we reserve the right to make changes, including to the running order and timings for the event may change prior to the event. Where reasonably possible, we will provide prior notice of such changes. Guests must be over 18. No guests under the age of 18 will be permitted entry to the venue. A ‘Challenge 25’ policy will be in operation, and as such, all guests are required to bring and present photographic ID on arrival at the venue. A maximum of four tickets can be purchased in each transaction, and we reserve the right to refuse entry to large groups on arrival. While alcohol will be available throughout the event, it is each individual’s duty to drink responsibly during their time at the event. In the event that a guest is intoxicated or their conduct is disorderly, we reserve the right to ask them to leave the premises and no refunds will be given. We will not provide lockers or secure storage for personal property of guests. Guests are expected to look after their personal property during an event. (ii) obey all instructions given by the host; and (iii) act responsibly and maintain a reasonable standard of safe behaviour. Guests may be refused admission to, or be asked to leave, an experience at any time if: (i) they fail to comply with any of these terms and conditions; (ii) they are rude, offensive or disruptive; and / or (iii) the host (acting reasonably) considers it appropriate. If a guest is refused admission to, or asked to leave, an event, they must do promptly and without disturbing others. Should a guest cause damage to property owned by the venue, a contractor for the event, or Waitrose, any compensation or repair costs will be sought from the individual after the event. We will only be responsible for loss or damage to guests' personal property if the loss or damage results from our breach of these terms and conditions or negligence. We will not have any liability to Participants for: (i) accidental damage or injury resulting from the actions or omissions of other Participants attending an experience; (ii) any loss of income, loss of revenue, loss of profits, loss of business or loss of contracts; or (iii) any indirect or consequential loss or damage that Participants may suffer as a result of our breach of these terms and conditions or negligence or otherwise. However, we do not (and nothing in these terms and conditions shall) exclude or limit in any way our liability where it would be unlawful to do so, including our liability for death or personal injury caused by our negligence or for fraud or fraudulent misrepresentation. The event may be recorded by us and we may take videos, photographs and other recordings, where you are recorded at the event. You agree to the publication of such photographs, videos, recordings, and/or likenesses of you (whether edited, adapted, modified or copied) and their use by us and those authorised by us, without prior notice or compensation, in any way which we may see fit now or in the future including but not limited to film, broadcast, radio, TV, publications, future events and publicity. You acknowledge that we have the full right to sell and/or profit from the commercial use of such photographs, motion pictures, recordings, and/or likenesses of you. These terms and conditions and their subject matter (and any non-contractual obligations arising in connection with them) are governed by English law and subject to the exclusive jurisdiction of the courts of England and Wales, except that if you are a resident of Northern Ireland you may also bring proceedings in Northern Ireland, and if you are resident of Scotland, you may also bring proceedings in Scotland. If we cannot resolve any complaints relating to the event between us, if you are a customer within the EU you have the right to submit your complaint through the Online Dispute Resolution platform at http://ec.europa.eu/odr for resolution.